I’ve always wanted to be abit of a futurist. Ever since the 911 terrorist attack, the world doesn’t look like it’s going to be a better place. North Korea is testing their missiles, while Israel is flying their missiles around the middle east. Religion has came back as a controversial topic, there’s books like the Da Vinci Code, movies like The Crusades, Syriana, Munich and Paradise Now. Oil prices and gold prices have stayed up and going up. Fuel alternatives have never taking off because oil prices have been very low, cheaper than milk, especially in the US. Will this trigger more innovations in alternative energy? The fuel price is so high because of some basic economic laws – supply cannnot meet demand, instead, we thought they were running out. This world is controlled by a few powerful people. Most of our lifes rely on the inventions of a few very smart people. Stephen Hawkings asked “How can the human race survive the next hundred years” and he has been giving lectures predicting “Earth might end up like Venus, at 250 degrees centigrade and raining sulfuric acid”. There’s alot of fear of global warming, yet USA still hasn’t signed the Kyoto Protocol. There’s stories about global dimming, and how it will make global warming so much worse. There’s stories about how we’re only looking in a small piece of a long global climate change cycle. There’s always two sides to a story, just like the Chinese theory of yin and yang. There’s obviously some hidden agendas to which side of story you go for. Unless we drop our capitialist greed, there’s no hope for a better world in the future. Great things were never a product of greed. The future of earth and human race depend on us to make the choice. – “The Inconvient Truth” movie with Al Gore on Global Warming. 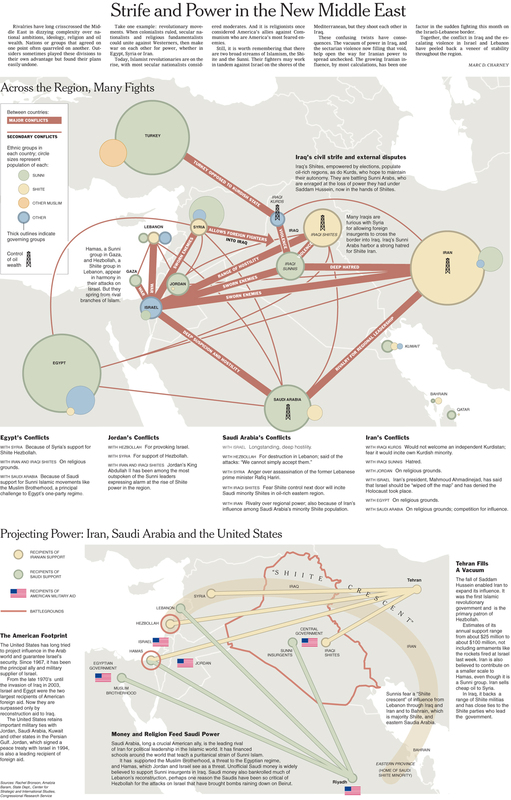 – nice diagram on Middle East conflict. ← some interesting facts and figures about the book industry.